1911. Donegal Vindicator. Lough Derg, two doctors and Peter McGuinness. Donegal Vindicator. 8th September 1911. LARGEST PILGRIMAGE FOR MANY YEARS. Not since the year of the Irish famine of 1846-47 has there been such a number of pilgrims to visit Lough Derg. For many years past there has been a steady increase of persons visiting this retreat, but this year the number has exceeded that of any previous year. Previous to the day of closing there were no fewer than one thousand persons on the island. The Very Rev Prior, Canon Keown, Enniskillen, speaking on the increase this year, which exceeded all others, said it afforded him much pleasure to see such large numbers visiting Lough Derg and performing its exemplary penance at a time when ‘materialism and infidelity’ were over-running so many other lands—a proof that the faith of St Patrick was still flourishing in Erin. All classes, he said, from the members of Parliament down to the humblest peasant, visited Lough Derg and underwent its austerities. It was, he said, particularly gratifying to notice the spirit of social equality that pervaded the ranks of the pilgrims—a spirit that existed nowhere else outside of Lough Derg, There was a general levelling up and down, and all met on the same footing, and at the same scanty hoard of plain bread and black tea once a day, and mingled together in the church, that was beautiful and edifying to see. He advised pilgrims to come out earlier in the season in future, to avoid the discomfort attendant on such large crowds as had been there for the past few days. He said he hoped next year to be able to improve on the voucher system for obtaining reduced railway fares. Donegal Vindicator. 11th August 1911. Sir Arthur Chance and Dr Rutherford held a consultation yesterday morning regarding Dr O’Flynn, who was so seriously injured in a motor-bicycle accident on Monday. As a result, a further trephining operation was successfully performed, and a large clot of blood removed from the brain. The patient rallied slightly, but in the afternoon he relapsed into unconsciousness. DEATH OF DR O’FLYNN. Dr Bernard Andrew O’Flynn, Manorhamilton, who was the victim of a motor bicycle accident on Monday, last, has succumbed to his injuries. The operation performed by Sir Arthur Chance on Tuesday gave considerable relief to the patient, who recovered partial consciousness, but he soon relapsed into a state of coma, in which he remained except for momentary rallies, until death subvened at 9 o’clock on Thursday evening. Dr Rutherford was in constant attendance until the last. The deepest sympathy is felt by all classes for his widow and young family. Donegal Vindicator. 15th December 1911. EDUCATION IN BALLYSHANNON. Donegal Vindicator. 11th August 1911. BELLEEK FAIR. The August fair in Belleek is generally recognised by producers and purchasers as an index of the probably current prices for the real season of the cattle trade beginning in September This year owing to many circumstances, including Strikes, weather, etc., the fair was not no well attended by cross channel buyers, besides haymaking being in progress the supply was remarkably shorter than usual. The general report of the market is that demand unless for local exchanges, especially to County Leitrim, was slow. Quotations— ; Calves, £3 10s to £5 15s: year-olds, £5 to £7; two-year-olds, £10 to £12 springers, £12 to £17; sheep (wethers) 18s to 25s; bonbams, 25s each. Beef and mutton absent. Donegal Vindicator. 11th August 1911. GALLANT RESCUE BY DR KELLY, BELLEEK. Dr Kelly, dispensary doctor, Belleek was the hero of a very plucky action the other day. It appears that a boy named Donagher, about five or six years old fell into the water above the lade near Belleek Creamery. An old man caught him but was unable to bring him ashore and ultimately he was compelled to lose his hold and the child was carried down through the salmon leap, and through the bridge into the rapid river below, where the water runs at a terrific speed. Dr. Kelly, who was in the vicinity hearing the cries, ran to the spot and plunging in, caught the boy and brought him ashore, where it was found that beyond the fright he had not suffered much. The speed of the torrent had kept him from sinking. One would require to see the place and the turmoil of the water before being able to realise the heroism of Dr Kelly in plunging in clothes and all. Donegal Vindicator. 8th September 1911. THE INVASION OF BALLYSHANNON. In the month of July, 1597, Sir Conyers Clifford, Governor of Connaught, aided by O’Brien of Thomond, Burke of Clanrikarde, O’Brien, Baron of Inchiquin, O’Connor, Sligo, and others invaded Ballyshannon with an immense army of horse and foot also with a maritime force sent from Galway, and after crossing the Erne, and sailing up from the sea invested Ballyshannon, besieged the castle of the O’Donnell, and occupied the Abbey of Assaroe. After a siege of several, days they were defeated in a pitched battle, the invading force repulsed and pursued by the forces of the O’Donnell over the plain of the Moy and many slain. The following ode is supposed to be composed on the occasion and sung to the harp by Owen Row McWard, the bard of the O’Donnells. To lay the hosts of Hugh. To aid Lord Clifford then. O’Connor Sligo, rose in might. The ancient town of Hugh. Upon the land of Hugh. We’ll ever sing O’Donnell’s name. The valiant son of Hugh! (+) From an unpublished novel of the author’s, ’Red Hugh O’Donnell last Prince of Tyrconell. Peter Magennis was born in County Fermanagh and became a National School teacher. The Ribbon Informer, 1874, was among his most successful novels, and he also wrote poetry. He was known as the bard of Knockmore. Born: 1817 Died: 1910. Seamas McAnaidh writes – Eoghan Rua Mac an Bhaird 1570-1630 was from Killbarron, married Maire Ni Chleirigh; was bard of O’Donnell and took part in the Flight of the Earls in 1607. Two of his sons were Franciscans, Aodh Bui was guardian of St. Anthony’s College, Louvain and Fearghal Og was hanged in Ireland in 1642. I suspect this ‘translation’ is an original work by Magennis. 3rd March 1911. A football match was played in the Erne Park on Sunday last, between a team representing Belleek and Ballyshannon Ernes, and resulted in a draw of two goals each. Mr J. Kane was referee. There was a nice rumpus at Fermanagh County Council, over the new roads in Belleek district. In the end the decisions of the District Council and of last meeting of the County Council were rescinded. Notice of motion to once more rescind was handed in by Mr Leonard, so that we may expect lively times. Kinlough is to have a system of sewerage and Mr O’Brian, who is at present architect for the scheme of Labourers’ Cottages, was, on Saturday, selected as engineer by the District. Council. The coming Census is going to make things hum in Bundoran. If half we hear be true, then it will be a plaoe worth living in at the end of March. The decision to become a Rural District within the meaning of the Act, will, it is stated, be responsible for much hospitality. An interesting Hurling match was played on Sunday last in the Rook Enclosure between Ballyshannon Aodh Ruadh (junr.) and Ballinacarrick Faugh-a-Ballagh’s, and resulted in a win for Aodh Ruadh. Sergeant John Gardiner, R.I.C., stationed in Ballyshannon, and Inspector of Weights and Measures, leaves tomorrow (Saturday) to take charge of Newtowncunningham Station in this County. During his stay here—-scarcely two years—he carried out his duties in a most impartial and straightforward manner, being held in much esteem by the people of Ballyshannon and district. He carries with him best wishes for his future prosperity. 3rd March 1911. BALLYSHANNON .LACE CLASS. ANNUAL CONCERT. The Ballyshannon Lace Class Concert has now become an annual event, and one which is looked forward to with eagerness, not only by the members of the Class, but by the general public, as being an assured artistic and musical treat in every sense, This year’s Concert maintained, if indeed it did not surpass, the usual standard of excellence. Once more the services of Miss Gabrielle O’Doherty, Strabane, had been secured, and those who heard her on her first visit to Ballyshannon were most anxious to enjoy that pleasure once more, and those who did not hear her were present this time in large numbers, and, as a consequence, the Rock Hall was well filled on Monday evening when the programme commenced. The first item was a solo by Mr William McCusker, Enniskillen, who is the possessor of. a powerful baritone, which was well suited to the songs selected, ‘The Outlaw’ and ‘ The Diver.’ An enthusiastic encore was accorded him, and he responded with ‘In Happy Moments,’ and ‘Beautiful Isle of the Sea.’ Miss Dora McCafferty’s rendering of ‘The Last Milestone’ was well worth hearing, and in response to an undeniable recall she gave ‘ The ……. Donegal Vindicator. 10th February 1911. DEATH OF MR JOHN J. GAVIGAN, U.SA. TOUCHING REFERENCES AND RESOLUTIONS. We learn with deep regret, of the death in Trenton, U.S.A., of Mr John J. Gavigan, brother of Mr James Gavigan, Belleek Pottery. The American newspapers contain lengthened references to his death, and the loss sustained by the various organisations with which he was connected. We tender our sympathy to his bereaved family and relatives. ‘The Daily State Gazette’ writes John J. Gavigan, one of the best known potters in the United States, died abont 2 ’clock yesterday morning after an illness extending for more than a year. He lived at 200 Reservoir Street. He was taken ill with insomnia, and serious nervous troubles followed. Then he contracted rheumatism, and one ailment aggravated the other until he became very bad. Mr Gavigan resigned his position as superintendent of the Hallmark pottery about a year ago, since that time he had been confined to his room. Mr Gavigan was one of the oldest potters in the country. When a boy he started work in the famous potteries at Belleek, Ireland, and learned his trade there. He was a skilled mechanic, and soon learned to master every detail of the pottery business. He became one of the best informed men in the country on matters pertaining to the pottery industry. Many sought his advice when they became puzzled over questions of the trade. He came in contact with all the leading pottery, supply houses in this country. The deceased leaves two sons—John, Jun, who is assistant superintendent of the Bellmark pottery, and Joseph a bookkeeper at the Mechanics National Bank. Mr Gavigan was a prominent member of the Ancient Order of Hibernians. Besides holding several local offices, ha was state president of the organisation for some time. He was a deep thinker and reader, and was known as a man of great wit. No matter how busy he was, he always had time to tell a humorous story and joke, and was pleased to entertain his friends. Ha was known for his oratorical ability, and won many friends by his kind disposition. Treasurer Oliphant and General Manager Gilkyson of the Bellmark Pottery, said last night that Mr Gavigan’s death would be keenly felt in the pottery world and in other business circles. Mr Gavigan was a member of Division No 1 A.O.H., St. Patrick’s Alliance, Branch No 1 District No 7; Trenton Council No 355, Knights of Columbus; Mercer County Board, AO.H., and the Holy Name Society of St. Mary’s Cathedral. The funeral will take place from his late home, 200 Reservoir Street, on Wednesday morning at 8 o’clock. Solemn requiem High Mass will be celebrated at the Cathedral at 9 o’clock. The interment will be in St. Mary’s Cemetery. Donegal Vindicator. 9th June 1911. DEATH. McDermott – At the Workhouse Infirmary, Ballyshannon on Friday 9th June, Terence McDermott. R.I.P. It was the Irish financial egg that was dropped in 1910, and nothing at all was said about the rights of the case or the blame for dropping. Of course in that particular year the finance of both countries was disturbed by the failure of Lloyd George, to carry his famous Budget, and there were uncollected arrears of taxation both in England and Ireland—in Ireland these arrears amounted to almost one million pounds. They have been collected since. The money was there safe, but we were assured in spite of that that as a nation we were financially down at heels, and we ought to be ashamed of ourselves. But in reality, it was the English egg if any which was dropped. Our congratulations to Dr F W Condon, F R C S I, on his appointment as Medical Officer to the County Donegal Railway’s joint committee, and also to the representatives of the Admiralty in Ballyshannon. In a petition to the Local Government Board it is stated that there is not one vacant house in Carrickmacross. Happy landlords! On Tuesday last, a man named McGuinness, a carpenter, residing at Bundoran, died suddenly from heart disease. Deceased who was very popular, leaves a wife and family, for whom the deepest sympathy is felt. The funeral took place on Thursday. The Brass and Reed Band competitions at Derry Feis take place to-morrow (Saturday). Where is Ballyshannon Brass Band? Only yesterday and our Brass Band might have stood against any, now where is it? We invite a reply. It required a great and steady effort to have a band worthy of the town, and the members owe it to themselves to give an explanation of the reason for the collapse. A little plain speaking may clear the atmosphere—let us have it. Very Rev Canon Keown, P. P., V G Enniskillen, blessed the foundation stone of a new hospice in Lough Derg last week, under the patronage of St Patrick and the Blessed Virgin Mary, It is intended for the exclusive use of women pilgrims, and will accommodate considerably over 200. The existing hospice will be entirely set apart for men in future. The building was designed by Mr W. A. Scott, architect, Dublin, and is of the most modern type. It is being built, of iron and concrete, and will be fireproof. The contractor, Mr Connolly, of Dublin is proceeding rapidly with the work, and hopes to have the increased accommodation available for this season’s pilgrimage, His foreman Mr Mulligan, and Mr Stell, who represents the company supplying the iron materials, courteously assisted Canon Known and Rev. Father Gormley, C. C., in the work of laying the foundation stone. Donegal Vindicator. 3rd February 1911. CAPTAIN COLLUM DEAD. KILLED BY THE ELECTION. All over Co., Fermanagh universal regret was felt on Saturday when it became known that Captain A. P. T. Collum, J P, D L, had died at his residence, Bellevue, Enniskillen. The deceased gentleman, it will be remembered, unsuccessfully contested North Fermanagh in the Liberal interest at the General Election last month. For over a year past he had been indelicate health, and the anxiety and worry entailed in fighting a contested Parliamentary election told seriously against his reserve of strength, with the result that immediately after it was over he took seriously ill, and from the first but little hope was entertained of his ultimate recovery. A son of the late Captain William Collum, Bellevue, he inherited a very considerable property in the county, on the death of his father including house property in the town of Enniskillen. He was a kind and indigent landlord, and none will more sincerely mourn his death than his tenants. He was born at Bellevue in 1866, and was educated at Cheltenham and St John’s College, Cambridge. For some time he was Captain in the 3rd Batt Royal Irish Fusiliers, and was also a member of the Irish Bar. He disposed of his agricultural land to his tenants under the c1903 Act, but retained in his possession the demesne grounds at Bellevue, comprising some 600 acres. On two occasions he filled the office of High Sheriff of Co Fermanagh. The Man who made Belleek John Caldwell Bloomfield. John Caldwell Bloomfield was born on the 5th of February 1823, a son of Major John Colpoys Bloomfield of Redwood, County Tipperary who had married Francis Arabella Caldwell, an heiress to Castle Caldwell, Belleek on the 11th of June, 1817. When he grew up and inherited the Castle Caldwell estate after a spell in the army where he had been stationed in China, he was very keen, perhaps recklessly keen, to improve his estate and the condition of those who lived on it. 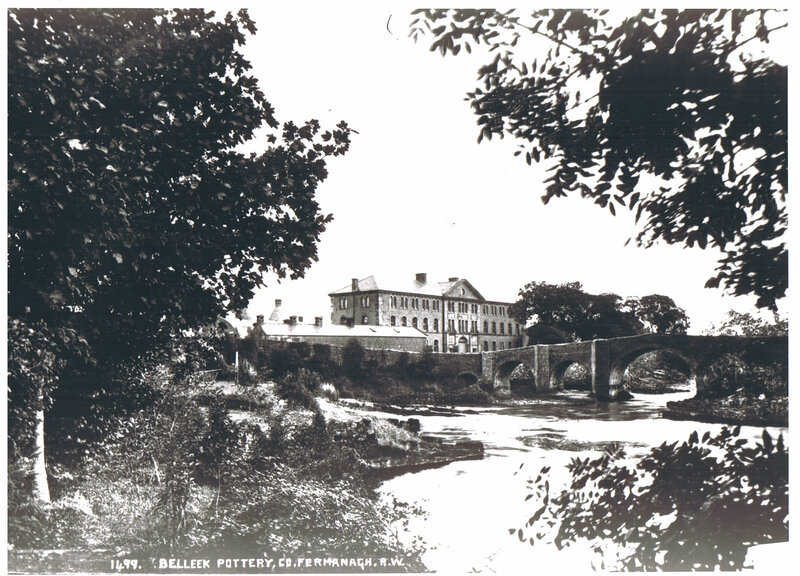 He operated the age old eel fishery at Drumanillar, a steamer on Lough Erne, ‘The Countess of Milan’ which sailed between Enniskillen and Belleek from 1855 to 1859 plus various cottage industries, mines, factories, a cement works, a brick works, a boot and shoe factory and ultimately his creation, Belleek Pottery. Almost all these ventures were financial failures and put the entire estate into an economic decline from which it never recovered and bankruptcy ensued. Bloomfield failed also in the political arena. He stood for election in the North Fermanagh Elections of 1885 but was defeated by the Nationalist candidate, William Redmond, brother of the future leader of the Irish M P’s at Westminster. 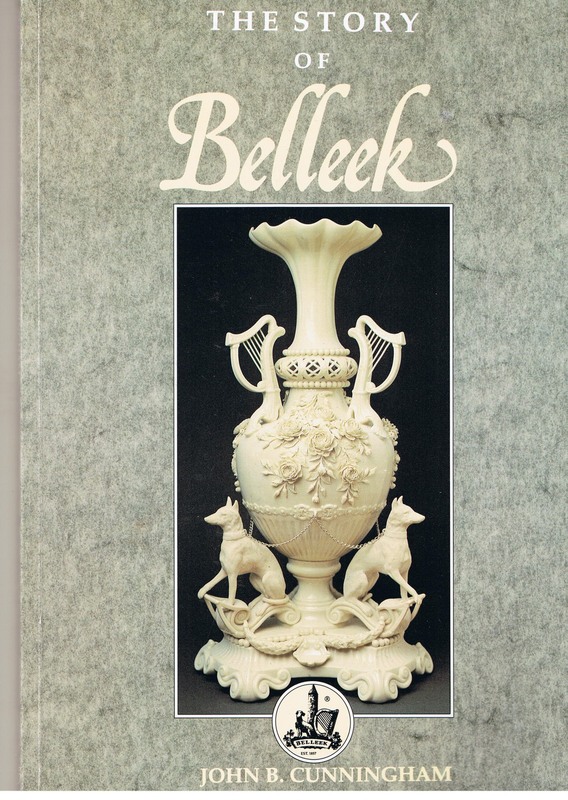 One of John Caldwell Bloomfield’s few ultimate successes was the founding of Belleek Pottery in the 1850s. On the company literature its foundation is dated to 1857 but as the foundation stone of the building was not laid until October 1858 this can only have been an outright guess. This enterprise which flourishes today is a tribute to this man who was chiefly responsible for setting it up. A Mr. David McBirney of Dublin was responsible for supplying the considerable finance necessary to begin the project (about £60,000) and Mr. Robert Williams Armstrong was its first manager. He was an architect and, combined with being a genius in pottery production, presided over the numerous wonderful early designs, many of which are still produced in the factory. Not least in the factors in its survival are the people of the area who deserve great credit and were responsible for keeping the projects going despite some great difficulties. However none of these factors can take away the reality that without John Bloomfield’s raw material from his estate, the site given to the factory with its enormous water power of the Erne necessary to drive the machinery and above all his enthusiasm, drive and determination there would most likely be nothing to make the name Belleek famous today all over the world. Local tradition has it that Bloomfield was something of an amateur chemist and that while in the British army had learned about kaolin, a rare clay used in making hard paste porcelain. He found a similar china clay on his estate and also with it feldspar another of the ingredients necessary for setting up a pottery. One often repeated story says that Bloomfield had noted a particularly tainted brilliance in the whitewash used by a farmer on the Castle Caldwell estate. It was found in a pit of ‘naturally burnt lime’ and Bloomfield had the place examined and the clay was found present and was admirably adapted for the manufacture of porcelain. Potters from Stoke-on-Trent were brought in to teach the local people their pottery skills and rows of houses were built for some of these workers, namely Rathmore Terrace, Belleek and Saint Patrick’s Terrace, Belleek where these are remembered as the ‘English Row’ and ‘Irish Row’ respectively, relating to their inhabitants in the early days of the Pottery. The Pottery itself was built on Rose Island one of the three islands then in the River Erne at Belleek. This enabled water power to be used in the pottery making and a large water wheel was constructed for this purpose. Incorporated in the new Pottery building on Rose Isle was a castle built by an earlier generation of the Caldwells in the mid-18th century for the Dowager Lady Caldwell and known as Belleek Lodge. The local raw materials both clay and feldspar were obtained from the Larkhill area about 6 miles from Belleek and transported by horse and cart to Belleek. Later, with the arrival of the Great Northern Railway branch line from Bundoran Junction to Bundoran, these materials were conveyed to Castle Caldwell railway station and brought by a train to Belleek. Flintstone was brought from Rossnowlagh and then burned and crushed in the pottery. Special clay for making saggers – containers in which the pottery was fired – was brought from the brickfields area on the shore of the Erne not far from Belleek. Local hard black turf and imported coal were used in the firing of the pottery in large outdoor kilns and in almost every respect this was a most self-reliant industry. For the workers the hours were very long, beginning at 6.00 in the morning during the summer months and eight o’clock in the wintertime plus a full day’s work on Saturday. A five year apprenticeship had to be served with slow graduations of pay. Many of the workers when fully qualified went to work in potteries in England, Scotland and even America where ‘American Belleek’ was for a time manufactured. From the beginning, the pottery set out to serve a market for high quality, expensive ware but also to supply the more readily entered market for common ware from plates and mugs to bedpans and baths. Lady Coralie Kinehan, John Maguire, Belleek Pottery Manager, John Cunningham, author and sitting Sir Robin Kinahan. 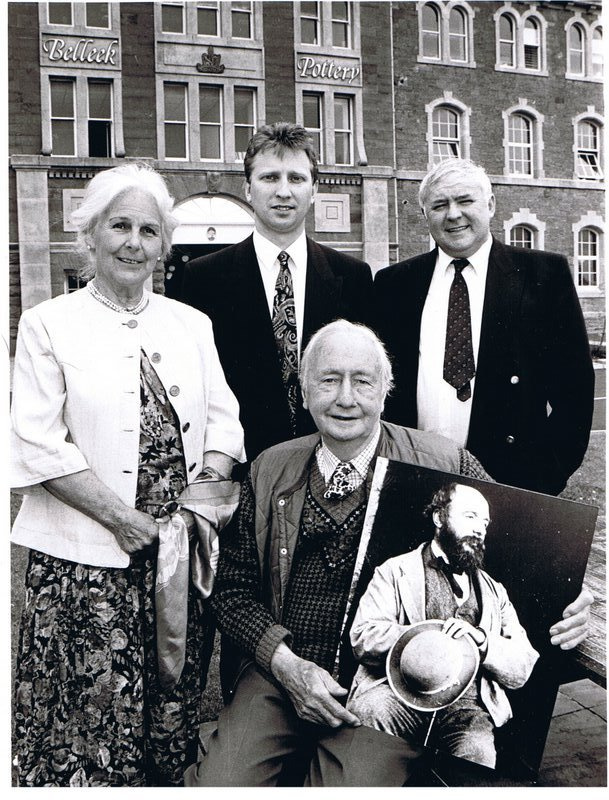 Lady Coralie Kinehan, John Maguire, Manager Belleek Pottery, John B. Cunningham (author) and Sir Robin Kinehan with portrait of John Caldwell Bloomfield, principal founder of Belleek Pottery on the occasion of the launch of “The Story of Belleek 1992. Of course there were other factors at work in Ireland at this time all contributing to the decline of landlords and their estates. John Caldwell Bloomfield certainly had a gift for getting into financially unrewarding corners and usually with the highest motives of benefits to his tenants and himself. The estate was eventually made bankrupt and the contents of Castle Caldwell, gathered over hundreds of years, sold off in a three day auction and John Caldwell Bloomfield died in poverty in Enniskillen. It was a sad end for a patriotic entrepreneur and still more galling is the fact that no statue in a public position has ever been erected in his honour. A sad state of affairs for the man who MADE Belleek.